Okay, since it is the last days of May now it's about time I review this double CD by three excellent Stockholm based musicians. Sista Maj is formed by Andreas Axelsson (drums and percussion, also for example in Eye Make the Horizon and Lisa Ullén's Group), Mikael Tuominen (bass, baritone guitar, electic sitar, in Kungen's Män) and Jonathan Segel (electric guitar, violin, organ, synthesizers, bass, in Kungen's Män, Øresund Space Collective, Camper Van Beethoven, etc.). The three-piece spent a studio week together in September 2015 to explore the possibilities of free improvisation and this session spawned the eight long pieces on this album. The overal feel of this album is rather laid-back, dreamy and tranquil although also dark and at times harder and even oppressive. 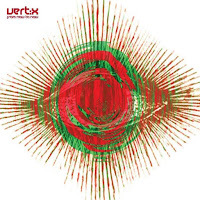 There are some experimental, jazzy and electronic vibes in the mix as well, but most of the stuff could be described as psychedelic, droney space/krautrock jamming. Some of it reminds me of Kungen's Män but no wonder, since two of the guys are also in that band. The music is quite different to for example Øresund Space Collective, though, since this is not that spacey or psychedelic but still very good. Okay, the faster "It Never Ends" could almost be an Øresund Space Collective jam as well if you added tons of space sounds... Most of the time the tempo stays pretty slow but for example on the longest (25:40!) track "A Very Heavy Feather" they also speed up a bit and the going gets quite rocking and heavy as well. It's really hard for me to point out any favourites since all the tracks are so different and I like them all. Let's just sum this up by saying that this is a really good, BIG package of improvised progressive psych music that will go down well with those of you who enjoy adventurous, instrumental free-form music. 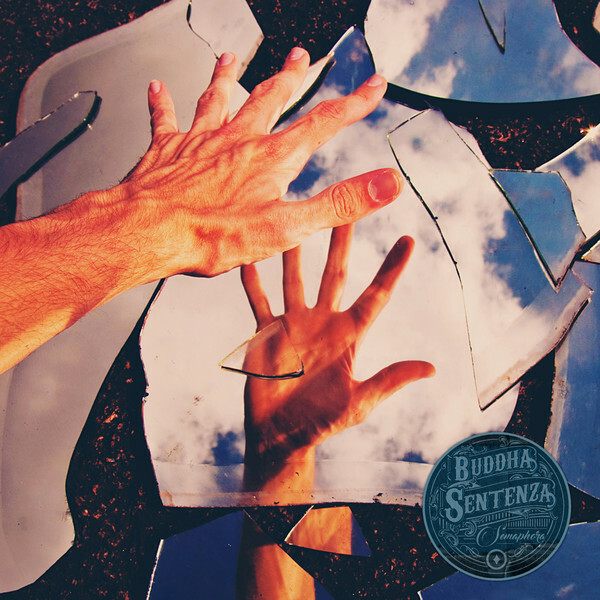 Ananda Mida is a new stoner rock band from the North-East of Italy featuring some musicians the fans of the Go Down Records already are familiar with. This is their debut album following a 7" single and I got to say this sounds pretty awesome and also quite original. I like the interplay between the two guitarists as well as the drum section and the singer is also very good. As an extra bonus the album also has a cool organ/synth player but he's not playing that much. I enjoy the sound that is not really that overtly heavy but sort of 60s/70s styled reminding me of bands like Wishbone Ash or Blue Öyster Cult. Most of the songs are closer to late 60s/early 70s classic/hard rock bands than the 90s stoner/desert rock bands that the Italians seem to often worship. This band even has a sense for melody and emotion, although they of course also know to rock out hard and jam. There is also a bit more experimental stuff like the instrumental "Passavas" and some more progressive songs like "Ors". For example "Askokin" comes closer to modern stoner rock and works out just fine too and the groovy "Heropas" could be an Brant Bjork out-take. The last track, the instrumental called "Occasion" is perhaps the most psychedelic piece on the album. Another cool rock band out of Italy, check them out! 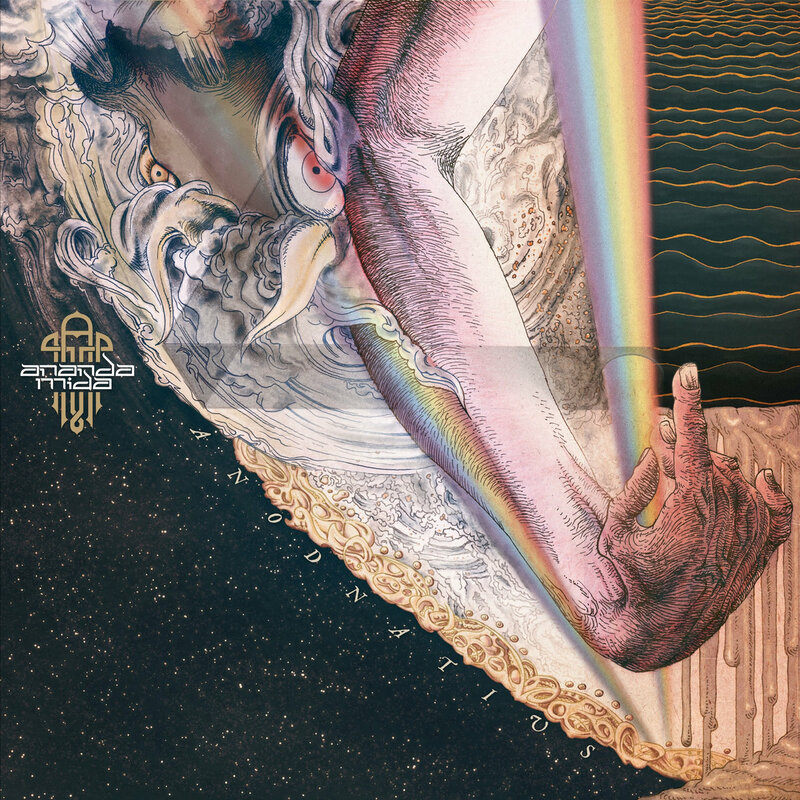 I reviewed the debut album by this German instrumental psychedelic stoner/prog/space rock band in 2013 and told that they are a mix in between Pink Floyd and Back Sabbath. This sort of still holds, but there are other elements in there as well. There is a strong 70s vibe although the sound is perfectly modern. I can hear echoes of bands like Eloy, Samsara Blues Experiment, Monkey 3, Colour Haze etc. just to name a few, but on their second album the band seems to have found their own thing as well. It's cool that the other guitarist also plays the violin and there's also lots of keyboards and synths. "Jet" is the energetic and heavy kick-start of the album and this gets almost metal to my ears. Not that far away from bands like Amorphis but a bit spacier. Nice! 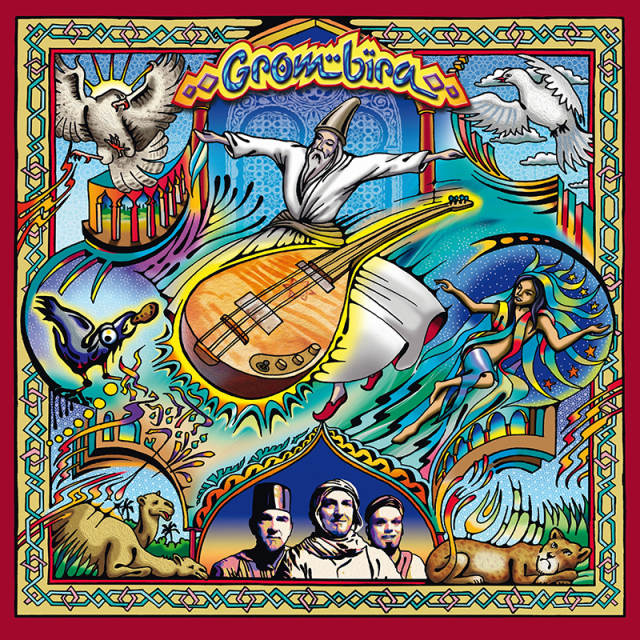 "Greek Ancestry" has some banjo or something in the beginning and then gets rather progressive in a folky way with some cool violin as well. It's still pretty heavy but also melodic. The ten-minute "Kréèn (Patagonian Lights)" has some weird spoken word samples at first and then it slowly starts to build up. This is a rather special track for sure. "Laika" is the shortest but perhaps also one of the most progressive tracks on the album and I can hear some theramin in there. "Blood Rust" is slow, darker and more hypnotic stuff with also some cool, spacey ambient stuff in the middle. Perhaps my favourite so far. The album is finished with the almost 11-minute "The End Is Coming... We'll Take It from Here" and this really is the album's grand masterpiece. Again, the going gets rather like metal at times, Opeth or Porcupine Tree come to mind. This is a very adventurous, atmospheric and varied prog metal track that has lots of different stuff and emotion in it. Amazing! Pater Nembrot is a psychedelic stoner rock band from Longiano, Italy. I'm not that familiar with them or their music, but they were formed in 2003 and this 2016 album is their third and they also have at least one EP out. The basic group is two guitarists one of which also sings, a bass player and a drummer, but the album also features Christian Peters from Samsara Blues Experiment on synth on one track as well as two other guests on piano and "space wind". The album starts off quite surprisingly with a short, melancholic pianoa ballad "Lostman". Like many Italian "heavy psych" bands nowadays, also Pater Nembrot mixes in some grunge as well, and you can hear some early Soundgarden and Nirvana influences on the second track "Stictch". Not a bad thing, this time. "Architeuthis" is the longest track at 10:12 and it's also one of my favourites including some atmospheric space jamming as well. Cool! "Young Rite" is an instrumental mix of Soundgarden and desert rock, and the long and adventurous "El Duende" brings to mind Pearl Jam a bit. "Overwhelmed" rocks hard and heavy being also a bit progressive. "Uknap" is a short bass piece and "The Rich Kids of Teheran" a pretty long and varied stoner/grunge number. The album is finished with the acoustic "Dead Polygon" that offers some piece and tranquility after all the hard rocking and rolling. All in all, a pretty nice album, and although not exactly my kind of stuff I find myself liking this disc. Also available on vinyl! 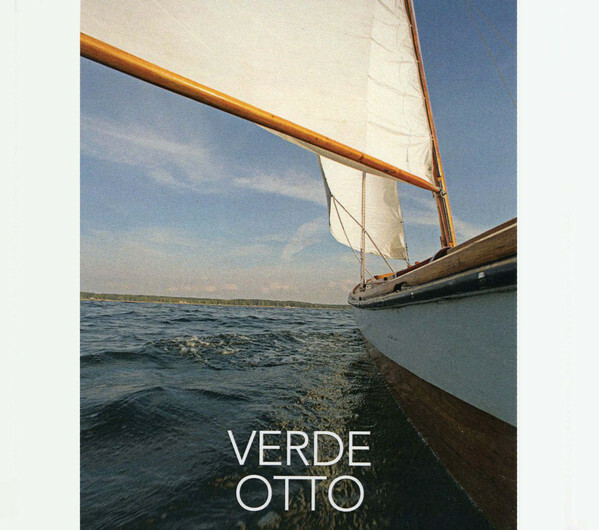 Verde is Mika Rintala's experimental electronic/ambient/avant garde/jazz/musique congrète project and I've reviewed some of his earlier CD-R/CD albums that he has been putting out since the late 90s. Mika is famous for his home-made electronic musical devices that make strange sounds. He has been collaborating with lots of Finnish left-field musicians like several ex and current Circle members (just check out Ektroverde for example) and this CD also features the 60s/70s counter culture hero Otto Donner (R.I.P. ), Rauno Nieminen, Esa Santonen, Janne Tuomi, Tapani Varis, Jyrki Laiho and Seppo Istukaissaari. This latest album dedicated to Otto Donner who passed away in 2013 includes 11 totally improvised tracks using what ever instruments were available. The music was recorded at Donner's place to an eight-track recorder and later mixed by Rintala. Otto mainly plays his Steinway grand piano adding also some vocals and horns. There are lots of acoustic, also archaic instruments which gives the album a wonderful, ancient folky edge although it's mostly electronic and experimental and piano is ofter taking the lead role. You can also hear some field recordings like sounds of the sea, birds etc. My favourites include the almost seven-minute, folky "Klyyvari" (nose in English), the jazzy and psychedelic, even longer "Hunsvotti", the short experimental electronic piece "Knaapi" and the atmospheric, trippy 15-minute "Luuvartti". This is a great homage to Otto and what he stood for but also a very interesting, creative as well as enjoyable album as a whole. Check it out! 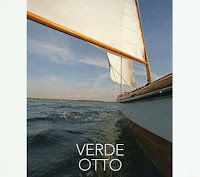 Verde Otto from Mika Rintala on Vimeo. 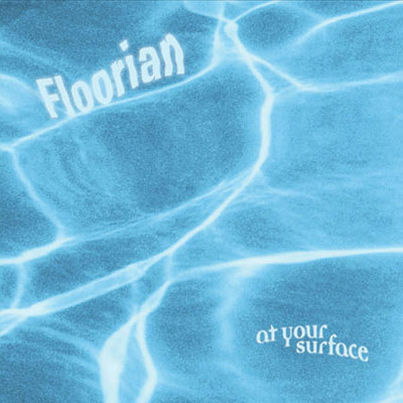 I've been a fan of Floorian since their debut album What the Buzzing released in 2004 by The Committee to Keep Music Evil. This North American psych rock band sort of delivers space rock in it's laid-back, dreamy and atmospheric form in the vein of Spacemen 3 or Pink Floyd but they also rock out a bit and are not afraid to put some more distortion when needed. At Your Surface is their fourth full-length release following the 2012 CD Cosmosaic. The album starts off with the organ-driven, lazy and dreamy "Ternion" that is probably the most Pink Floyd insired track on the album. Great! 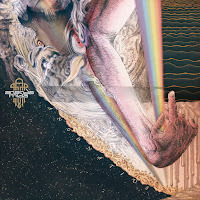 "From On High" is a groovy, excellent and heavier psych rock blast but also quite slow and melodic. The beautiful but also rather experimental and industrial sounding "Face" comes next and then it's time for the 9-minute, weird and heady psychedelic blues trip "Icaro". Druggy stuff... 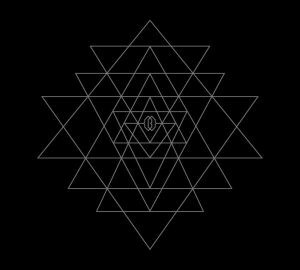 Fans of The Myrrors, The Black Angels etc. will enjoy "Spinning Time", what a great trippy track with some 13th Floor Elevators vibes. The album is finished with the 14-minute-plus mind journey "Agra Man" that really takes you out there. I love the addition of oud, sitar, tabla and Moog on this one. 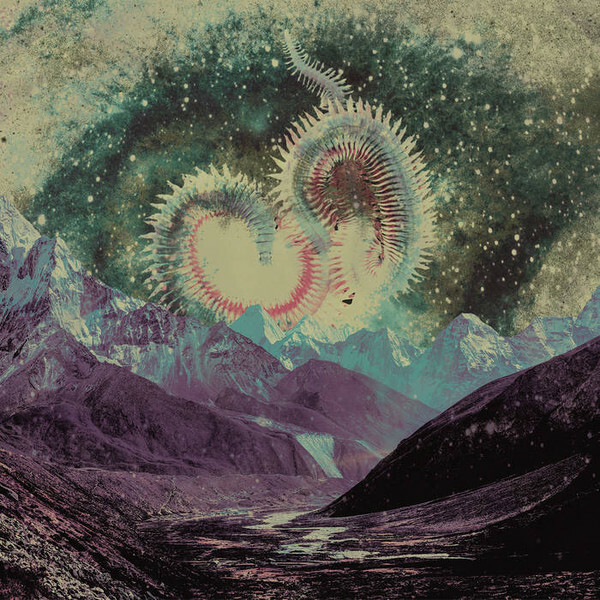 Some of the best psychedelic shoegaze space rocking I've heard in years! Check out this excellent band if you haven't already, you won't regret it. Black Willows from Switzerland gave us their debut offering Haze in 2013 and this new album Samsara was released in late 2016. The band continue in their dark, occult-inspired, psychedelic, hypnotic and heavy path and sound great. This Lausanne-based shamanic doom/sludge/stoner band sort of sound pretty original although you can influences from for example Sleep, Om, Bong, Lamp of the Universe, Arc of Ascent, Oranssi Pazuzu etc. The main emphasis usually is to get as hypnotic and heady as possible, so the heavyness comes second which is fine by me. The bit shorter, introductory title track "Samsara" starts off the rituals slowly creating a dark, mystical atmosphere before the heavy, slow riffing and mantra styled vocals of "Sin" fill your head. This one has a very Sleep/Om like vibe and I love it. You are spellbound for eight minutes. The even longer "Rise" gets you even deeper into the dark trance and makes you see things that have been hidden from most of humanity for ages... Some cool, more energetic jamming/soloing on this one as well which is cool! Spiritual stoner rock journey for sure. "Mountain" is a bit shorter (only 5:36...) and groovier stoner/doom metal track that has some Electric Wizard/Cathedral vibes. 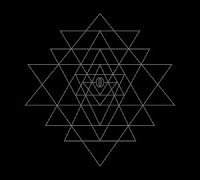 On the 15-minute "Jewel in the Lotus" the band get very hypnotic and spiritual and I'm reminded of Lamp of the Universe and Arc of Ascent even though there are no Indian instruments in use here. Things get heavier in the Sleep vein after the six-minute-marker and you just can't avoid banging your head to the slow, heavy and doomy groove. Later on there is some more atmospheric stuff for a while... Great! The CD version also includes the 25-minute, repetative and melancholic "Morning Star" that sounds like more traditional doom metal to me with lyrics about -you guessed it- all occult metal fans's best friend Lucifer. You can buy the CD and LP directly from the band's Bandcamp site and also the debut album seems to be available so check that out as well if you are into heavy, occult and psychedelic doom metal/stoner rock. 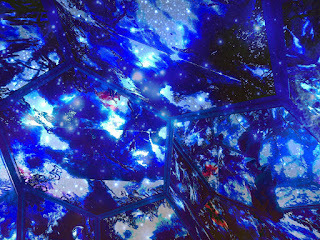 Astral Visions #73 now online! 14 Sycamore Trees (from 12" split) by Acid Mothers Temple and the Melting Paraiso U.F.O. Föllakzoid feat. J. Spaceman ‎– London Sessions 12"
Giöbia ‎– What Have You Done / Silver Machine 7"
Vert:x is a psychedelic, noisy, punky & hard-rocking space/krautrock band from Chester, U.K. I've had them on my radar for about ten years now since their space captain Neil has been sending me their great, privately pressed CD-R's for review ever since they started. The band's influences include for example NEU!, Hawkwind, Can, The Seeds, Chrome, Earthling Society and Spiral Navigators. They have lately also worked with Fruits de Mer Records on several compilations that are definitely worth checking out but From Now to Now that will be released in a couple of weeks on The Weird Beard label (limited to 250 copies only) is their first full-length vinyl album. About time, I'd say! Also worth getting is the superb four-way-split album Magnetic North released last year on Drone Rock Records. From Now to Now includes just three instrumental tracks, but they are very long... The suitably named opener "Space Junk" really rocks out in a noisy Hawkwind/NEU!/AMT style. I love the motorik beat, harsh guitar, spacey electronics and wild sax, excellent! This is the shortest track on the LP at "mere" 7:47. On the 16-minute "Suns of Ra" things get more cosmic and you can hear the heady, out-of-this-world Earthling Society influences. No wonder, since Fred from E. S. also has been playing in Vert:x. This one will leave your mind totally spaced-out and levitating... Trippy! On the B-side we've got the 26-minute (!) "Planet Of The Mindstealers" And if you still had a mind after the A side it's totally gone now. I can hear some Chrome and Hawkwind influences again on this one. This is cosmic, hazy and acid punky space rock bliss! All the tracks have been previously released on the band's CD-R releases but it feels so good to have them now out on vinyl. I hope the band will do some more fresh recordings for a second LP release soon since this is just great, mind-blowing stuff! Hear ambient space music compiled by Dj Astro on Big Bang Legends cosmic tram ride! Something special for Saturday... 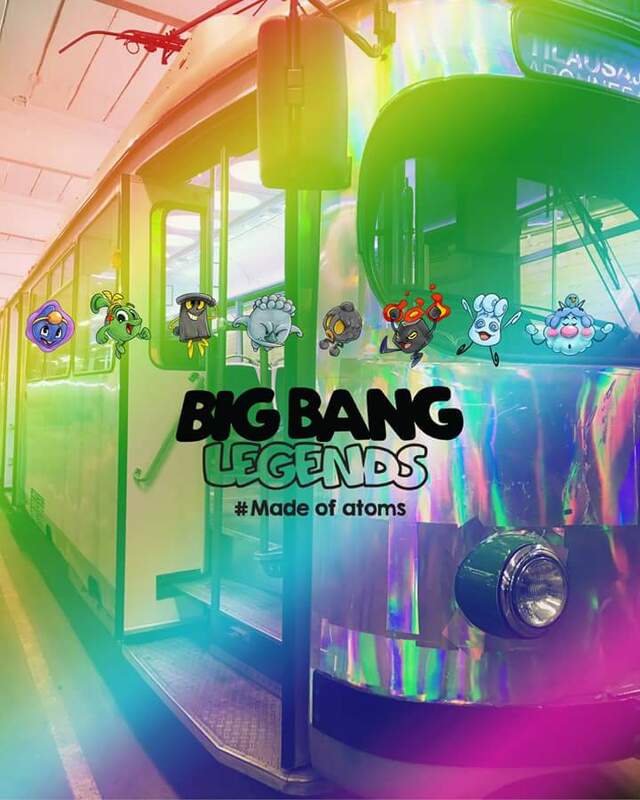 If you are in Helsinki, you can hop in to the Big Bang Legends tram, play the game and enjoy ambient space music compiled by Dj Astro! 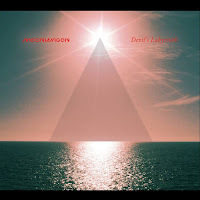 Moonwagon is a progressive hard/psych/space rock band from Kokkola, Finland. The band has carried on as a trio after their synth player left before the third, a bit more jazz-rock-fusion styled album The Rule of Three (2015). All three members are multi-instrumentalists, so no problem in the studio. As influence they give out band names like Rush, Hawkwind, Pink Floyd, Yes, Genesis, Led Zeppelin, Black Sabbath. To my ears they are never too progressive, totally out-there psychedelic or really that heavy, but a good, pleasant and listenable, melodic mix of all those elements. On this brand-new, professionally made CD-R EP they offer five interesting, mostly instrumental tracks. "Devil's Labyrinth" starts off the disc combining Rush-like hard rocking with some folk rock elements. I like for example the bass solo stuff as well as the cool keyboards and sort of airy, fresh vibe the track has. Definitely for Rush fans out there. "Haunted Hallways" is another great mid-tempo prog/hard rocker with also some more adventurous parts and again excellent playing by the band. Some of the synths towards the end bring to mind Eloy. Excellent! 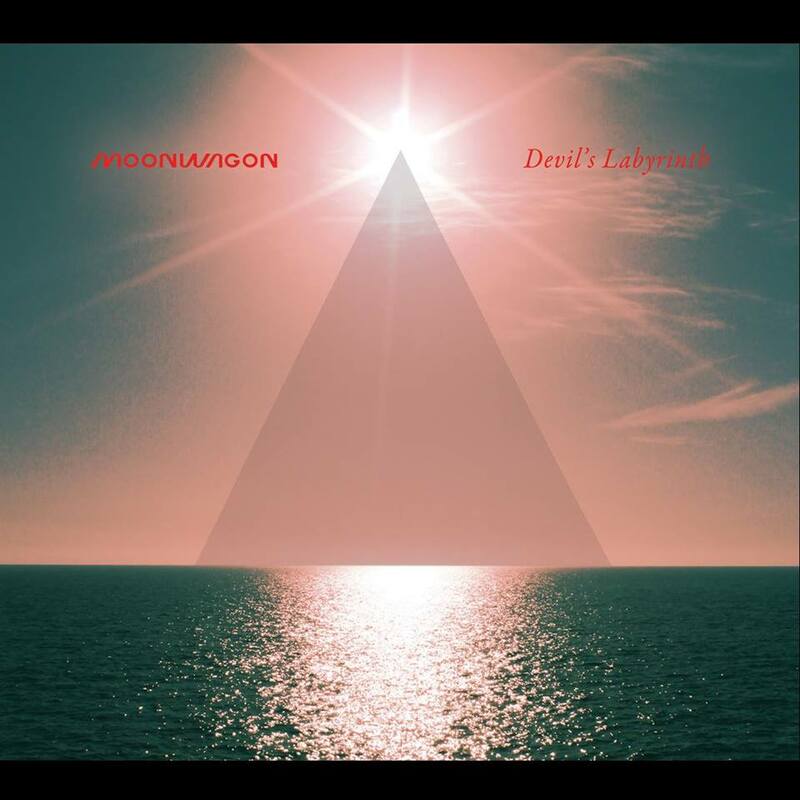 "Alchemy" is a nice, semi-acoustic folk rock piece with percussion and "Dus Aster" a shorter syntheziser piece a bit in the Tangerine Dream vein. My favourite by far is the groovy and hard rocking space rock number "South of Bermuda" that I have also used in my Astral Visions podcast. This one has some similarities with Hidria Spacefolk and Hawkwind so you bet I like it a lot! The track also has some vocals which is cool. I also love the guitar work especially on this track, a total winner! I look forward to see how the trio handles all the instrumentation live and tomorrow will be a perfect opportunity to find out since Moonwagon plays together with the superb prog rock band Malady at Semifinal in Helsinki. Okay Oriental space rock cadets: take out your flying carpets! 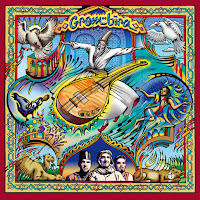 Grombira is a new band playing a mix of Oriental ethnic/world music and psychedelic space rock and they sound just awesome! Although the three guys are actually from Bavaria, they do sound like they are from ancient Persia, India, Turkey or Northern Africa or someplace like that. With bass, drums, sitar, saz, oud, flute, percussion, synths and some vocals they deliver you the feel of walking through dry, sun-burned deserts to the oasis and exotic ancient marketplaces full of heady and mesmerising smells, snake-charmers and wonderous artefacts. Welcome to One Thousand and One Nights! The album includes just six tracks, but most of them are quite long. The mysterious journey starts off with "Pürreé" that offers marvellous Arabian moods, melodies and rhythms. Right after the five-minute marker a faster, hypnotic rocking starts and things get pretty groovy before we also get some jazzy jamming. "Carpe Noctem" has a very cool ambient beginning taking you deep inside the Oriental night with all the stars shining in the night sky. This is a very hypnotic piece and even makes you want to dance in trance. Somehow brings to mind Psychomuzak. There are also some vocals in a weird language later on. One of the highlights! The shorter "Caravan" is a bit more minimal and pictures the wandering of the camels also including some field-recordings. The B-side of this limited vinyl release begins with the melancholic and mesmerising "Goats in Space" that sounds a bit like Blaak Heat being the most Western sounding psych/stoner rock track on the album. It also has vocals in English. Excellent! "Priest of the Horny Kong" is a cool mix of spacey trance rock and groovy Anatolian psych rock vibes and I really enjoy this one. The album is finished with the wonderful "Selma" that after it's dreamy beginning takes you into some strange, intoxicated party in a very exotic setting. This track has a somehow happy, uplifting vibe and leaves you feeling good and refreshed after all the travels across the deserts and mountains. 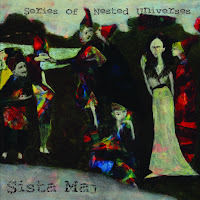 This album is a must-have for all friends of Oriental psych rock!